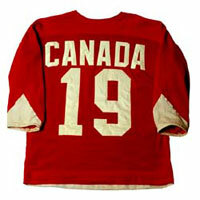 Paul Henderson's famous #19 jersey worn during games 1-4, all played in Canada. Henderson had the series of a lifetime, scoring the GWG's in game #6, #7 and #8. 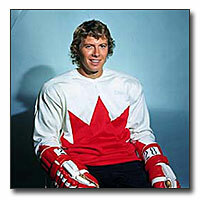 Bobby Clarke beat out Dave Keon for the final spot on Team Canada's roster. 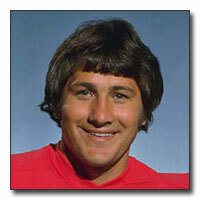 He played an influential role as the center between Ron Ellis and Paul Henderson. Canada had originally invited goaltenders Bernie Parent and Gerry Cheevers, defenseman J.C. Tremblay as well as forwards Bobby Hull and Derek Sanderson to its Summit Series try-out camp. 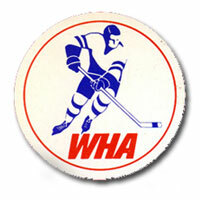 However, since all five had recently signed contracts with the WHA, NHL President Clarence Campbell nixed their inclusion. Gilbert Perreault and three other Canadians, Vic Hadfield, Rick Martin and Jocelyn Guevremont, all left the team during the European swing of the tournament complaining about their lack of playing time. 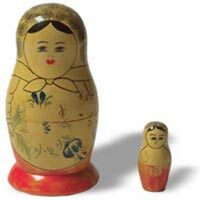 Soviet patruska dolls were one of the gifts exchanged between Canada and the Soviets in the eight game mini-series. 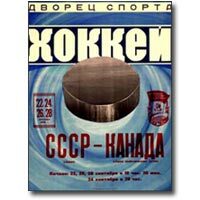 Soviet advertisement taken from the wall of Luhzniki Ice Palace in Moscow by Canadian fans following their victory in game #8 of the series. 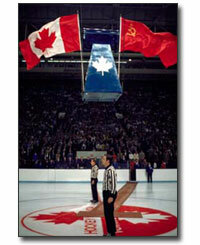 For one of the few times in the storied history of Maple Leaf Gardens, the building hosted the Soviet Union. Game #2 of the Summit Series proved to be Canada's 1st victory. Ticket stub from game #8, the last game from, "The Series of the Century". Canada narrowly defeated the Soviets 6-5 to claim a 4 games to 3 advantage.